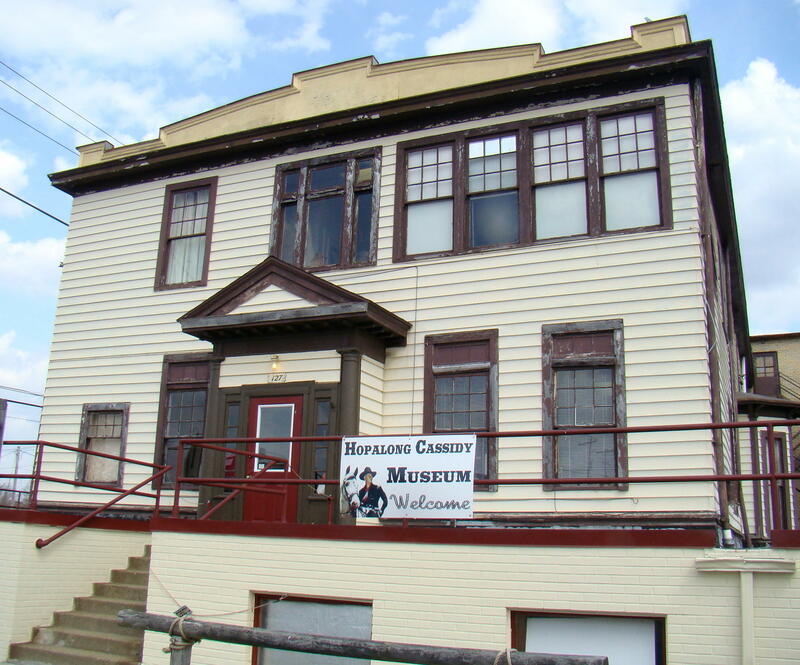 Hopalong Cassidy, “Pride of the West”, is also “Pride of Cambridge, Ohio”, the boyhood home to Hopalong Cassidy and the Hopalong Cassidy Museum. William Boyd, aka Hopalong Cassidy, was born close by in Hendrysburg, Ohio in Belmont County back in 1895. While he only resided in Cambridge twelve years, they are still proud to call him a home-town boy. The family moved West at that time to Tulsa, Oklahoma, and at about the age of 20, William ended up in California where his good looks and winning manner were noticed by the film industry. None other than Cecil B DeMille, who became a long time friend, took William Boyd under his wing, and got him his first acting contract at $25 a week back in 1918 as leading man in the silent film industry. When the role of fictional cowboy, Hopalong Cassidy, came up, director Harry Sherman felt William Boyd was a natural. In his black cowboy hat riding Topper, his white horse, Boyd soon became a national hero known for his gallantry and fair play. 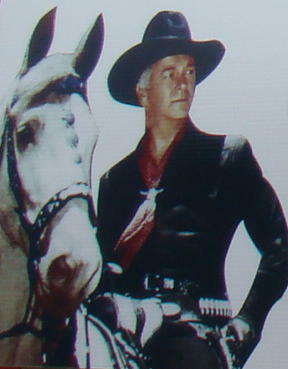 After 66 movies portraying Hopalong Cassidy, William Boyd became better known as Hoppy to his friends. The story of his nickname began with Cassidy getting shot in the leg during a gun fight. When recovering from his gun wound, someone asked how he was feeling, to which he replied, “I’ll manage to hop along.” Thus the name Hop-along Cassidy. After its success at the movie theaters, it was decided to have a Hopalong Cassidy TV series…also a big success. In 1950, Hopalong Cassidy became the first network Western television series. Laura said, “That was like a slap in the face from the Big Apple.” After that, she began pursuing the idea and in 1990 it was decided to use Hopalong Cassidy for the theme of their Spring Festival. Today, that Hopalong Cassidy Festival still is enjoyed by people from all over the world and is now held annually in May at the Pritchard-Laughlin Civic Center just outside the city. Many movie stars attend the Festival to pay homage to Hoppy, one of those great cowboy legends. Hugh O’Brien from Wyatt Earp has attended as well as several stars of Gunsmoke: Bo Hopkins, Ben Costello, and Becky Burgoyne. Even William Boyd’s wife, Grace, has been in attendance. Fans are still eager to catch a glimpse of these celebrities and perhaps obtain their autographs. 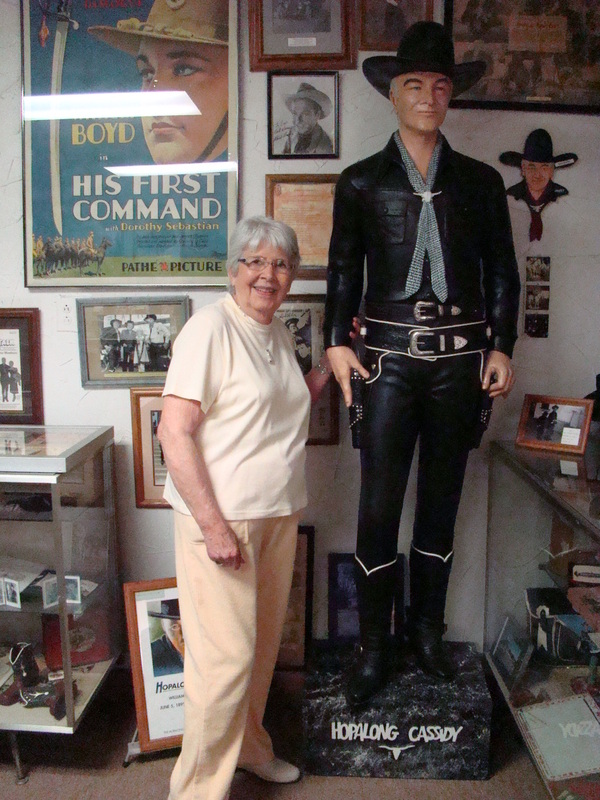 Today there is a museum in Cambridge, Ohio which houses a giant assortment of cowboy collectibles. Located at Scott’s 10th St. Antique Mall, this is a hot spot during the annual Hopalong Cassidy Festival. Three rooms are packed with Hoppy memorabilia, all part of a personal collection owned by Laura Bates, local Hoppy organizer and enthusiast. Here fans have purchased an old tin lunch bucket and thermos for the price of $395.00 or an Easter card signed by Hoppy for $195.00. There are many memorabilia available…for the right price. In his hey-day, Hoppy received around 15,000 fan mail letters a week. Today there is still a meeting of the Hoppy Fan Club during the annual Hopalong Cassidy Festival in Cambridge, Ohio. Laura Bates is president of the fan club, which was formed back in 1991 and publishes quarterly a newsletter, “Hoppy Talk”, which is distributed to members of Friends of Hoppy. Membership was around 500 in the beginning, but has dropped to about 300 members today as younger adults have little memory of those great cowboy heroes. 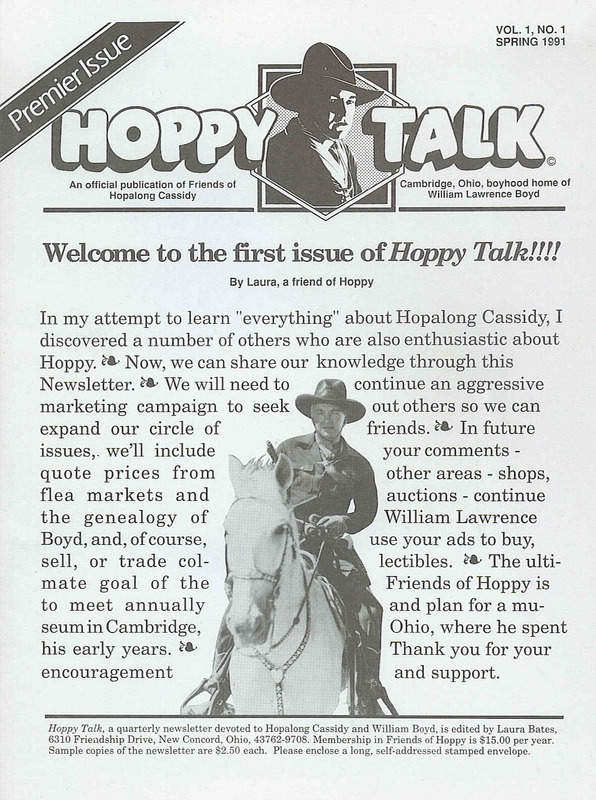 “Hoppy Talk” is celebrating its 24th year of publication in 2013. William Boyd and Hopalong Cassidy are synonymous…Hopalong Cassidy, his alter ego. When he finally retired, he turned over his entire crew and cast to a new Western just coming on the scene…Gunsmoke. Boyd didn’t sing, dance, play sports, or race cars, he was simply Hopalong Cassidy. He smiled, waved and shook hands. 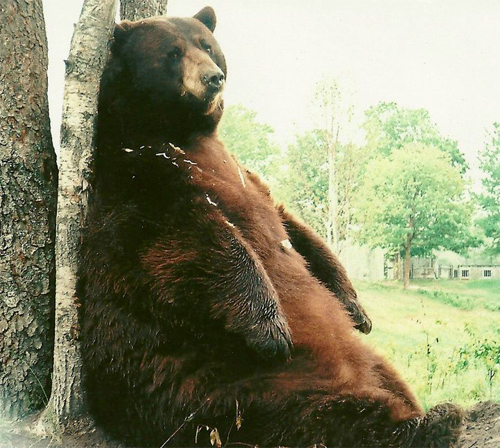 He was everybody’s Mr. Good Guy and his favorite drink was a nonalcoholic sarsaparilla! The Hopalong Cassidy Museum is located in the South Tenth Street Antique Mall in downtown Cambridge. There is easy access as Cambridge is at the intersection of I-70 and I-77. Wheeling Avenue is their main street and the museum is just a half block south of Wheeling Avenue on 10th Street. May the ghosts be with you while you spend the day or night at the Lafayette Hotel in historic downtown Marietta, Ohio. Visitors and employees anxiously report stories of paranormal activity in this grand hotel on the banks of the confluence of the Muskingum and Ohio Rivers. After a fire destroyed the Bellevue Hotel, another hotel was constructed on the original foundation. In 1918 the present triangular shaped Lafayette Hotel opened for business. The name was chosen to honor Marquis de Lafayette, French hero of the American Revolution, who was believed to be the first tourist to visit Marietta in 1825. There is even a plaque, near the hotel at the edge of the Ohio River, marking the spot where he came ashore. 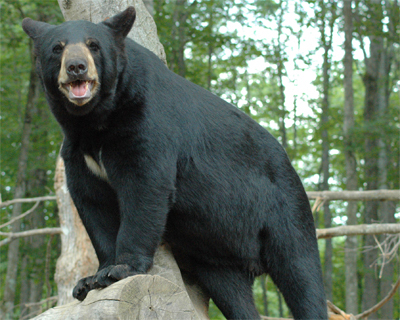 A popular meeting room bears the name of Rufus Putnam, who many list as the founder of Ohio. His leadership established Marietta as the first permanent United States settlement in the Northwest Territory. In a letter sent to his former home, Rufus Putnam described the land along the Ohio River to his friend as: “a country of most pleasant climate and of the rarest beauty and enduring charm”. The Riverview Lounge is where the “Lady in White” often appears hovering over the carpet, while she smoothly moves through the room. 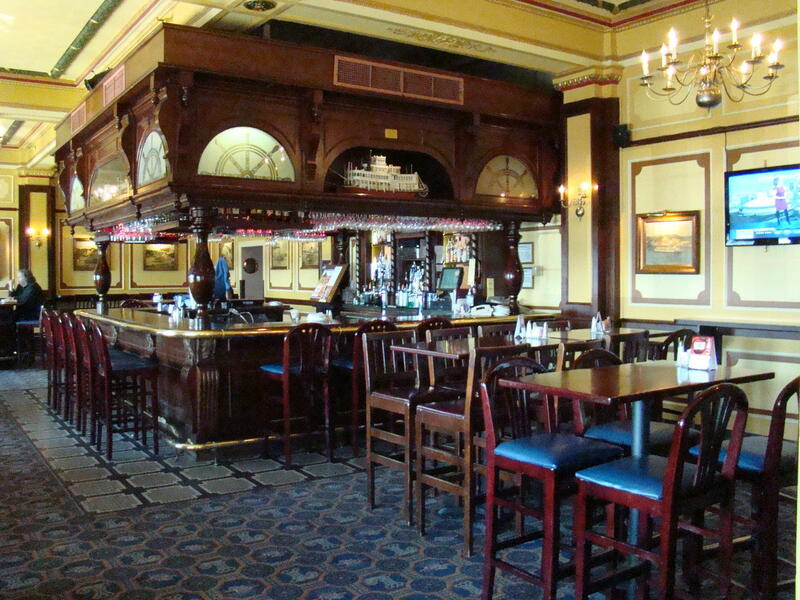 The bar happens to occupy the same area where the ladies’ dressing room was located in the original hotel. When selecting a room in Marietta’s only downtown hotel, you will probably be given a choice of view – either the Muskingum River or the Ohio River. Here the ghost of Mr. Durward Hoag, former owner of the hotel, watches over guests and staff from both directions. Sometimes guests feel an icy cold draft pass through their well heated room. Evidence of his presence appears in flashing light bulbs, rearranged papers, hidden objects, and often merely a wisp of light. Maybe Mr. Hoag’s spirit is bored! When speaking with recent visitors, footsteps were reported outside their door, but no one was in evidence. The elevator, carrying no passengers, left the floor a couple times during the evening and headed to the rooftop. 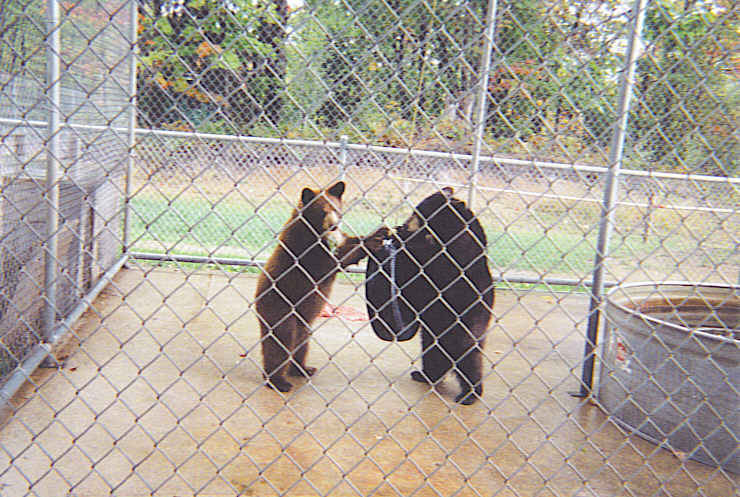 Later that night when they were in bed, another couple felt someone jump in the center of the bed where they were resting. 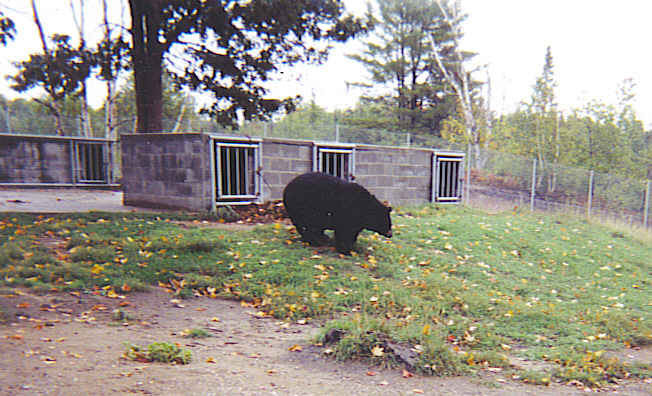 All guaranteed they had not visited the Riverview Lounge. The Gun Room is a popular place for lunch. 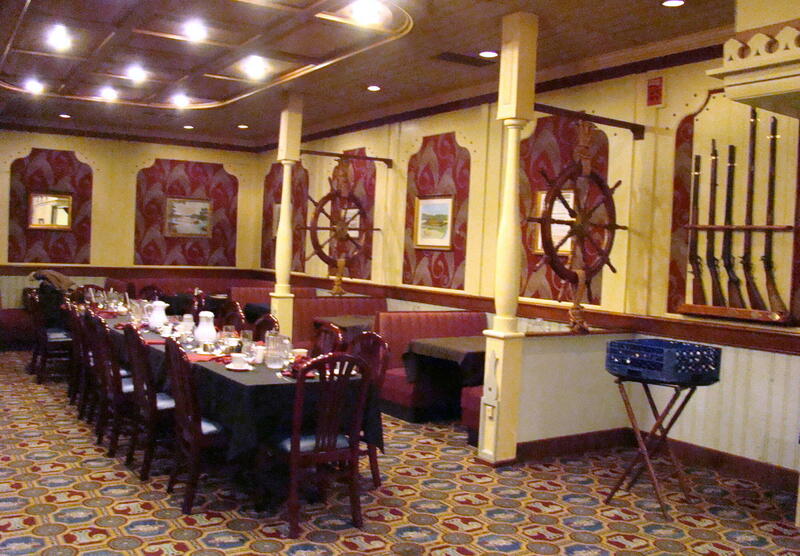 The walls are adorned with photos of great majestic sternwheelers that traveled the Ohio River. A display of antique long rifles contains one made by J.J. Henry that accompanied the Benedict Arnold expedition to Canada in 1775. Waitresses tell of coming in early to work and seeing a figure leaving the front section of the restaurant. 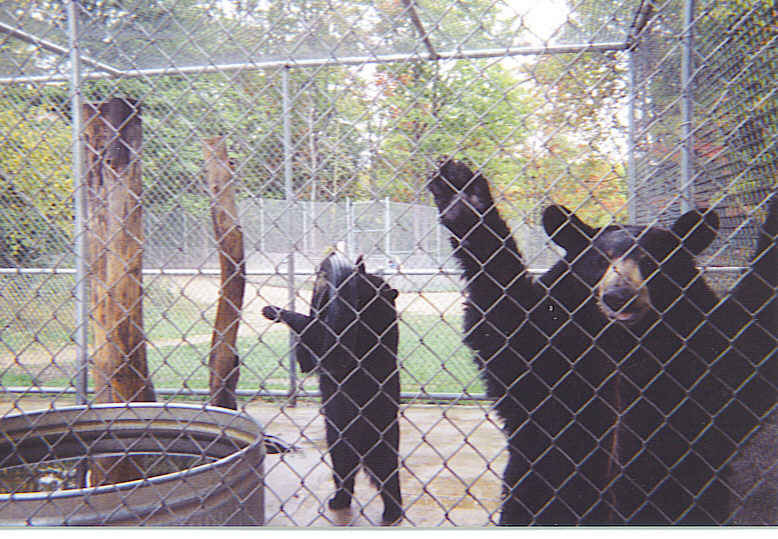 Often the swinging doors to the kitchen open for no reason at all. Some feel that Mr. Hoag is checking on his staff. On the plus side, these spirits are never harmful. Enjoy the ambience of this richly historical Lafayette Hotel on the river sometime soon. They have been expecting you for nearly a hundred years! 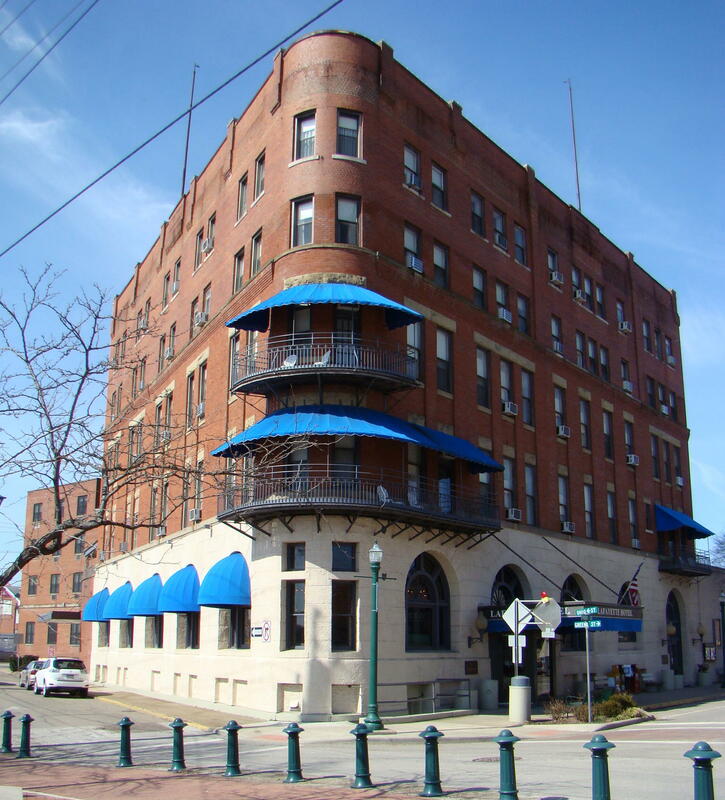 The Lafayette Hotel is located at 101 Front Street in Marietta, Ohio. Exit I-77 at Exit 1 and follow Route 7 South, which is also Pine Street. At the third light, Pine Street continues straight and becomes Green Street. Continue on Green Street until you come to the hotel on the corner of Green Street and Front Street. Parking is available between the hotel and the Ohio River as well as on the other side of the hotel.